Suture Anchors are mechanical devices that have been engineered to attach ligaments and tendons to bones. They are marvellous feats of engineering and have totally changed the way many injuries are treated. Each Suture Anchor can be divided into three parts – the anchor, the eyelet, and the suture. The Anchor – This is the portion which gets inserted into the bone. It could be made of metal or a material that gradually dissolves into the bone over time. The Eyelet – This is the part through which the suture passes and it is right between the anchor and the suture. The Suture – This part is made of materials that can be absorbed by the body or cannot be. It can be made of Ethibond, Panacryl, Vicryl etc. The eyelet attaches the suture to the anchor. So basically, the anchor is attached to the bone and the suture, to the tendon. Suture anchors are inevitable parts of repair surgeries and research is always going on, towards the development of new age engineering materials with desirable properties. There are many kinds of suture anchors presently used. The sutures can be both mono-filament type or the multifilament type. The monofilament resists germs from residing and ties in a smooth manner. The multifilament is easier to handle and is made of many filaments twisted or braided together. 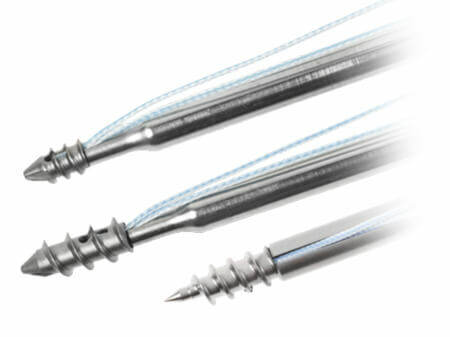 If you would like to know more about Suture Anchors, feel free to get in touch with us.